Donation from the Knights of Columbus Council 2942 of Dundalk to the Children’s Faith Formation Program in the pastorate of Sacred Heart of Mary and Our Lady of Fatima in Baltimore, and St. Rita in Dundalk. On Oct. 22, the Knights presented separate checks of $1,500 to St. Rita and Sacred Heart of Mary. “The Knights have made contributions to our program for a number of years and have always supported our efforts of passing the Faith on to a new generation of Catholics,” wrote Father George Gannon, pastor, in a recent bulletin announcement. Books collected by Geoffrey Forsyth, a member of Boy Scout Troop 396 and senior at St. Mary’s High School in Annapolis, who wanted to complete his Eagle Scout Project in a unique way. Forsyth collaborated with the African Library Project to collect and donate books of a fourth- to eighth-grade reading level that would be used for the creation of a library in Malawi, Africa. His project gained momentum at St. Mary’s, where approximately 350 books were collected; the remainder of the books came from boxes at the public library. Forsyth completed his Eagle Scout project May 31. In September, he received pictures from the African Library Project of his books being delivered. Forsyth hopes to pursue a career as an officer in the military. Pounds of supplies a Mount St. Mary’s student and his rugby teammates donated to Hurricane Irma victims. After parts of Luis Turbyfield’s home community of Providenciales, Turks and Caicos Islands, were destroyed, he reached out to his university’s community and administration for assistance. The head coach of the men’s rugby team, Jay Myles, requested that families attending FamilyFest make donations. The community responded with clothing, diapers, work gloves, dust masks and toiletries. The men’s rugby team sorted the donations and prepared them for transport to the islands. Turbyfield, a graduate of Archbishop Curley High School in Baltimore, and his family personally delivered the donations to Providenciales the week of Oct. 9, over the school’s fall break. With the help of the local Salvation Army, Luis helped distribute individual bags of supplies. He plans to return in December with a new collection of needed materials. Dollars that students of St. Thomas More Academy in Middletown collected for Catholic schools in areas recently affected by hurricanes as part of the National Catholic Education Association’s Student to Student Initiative. 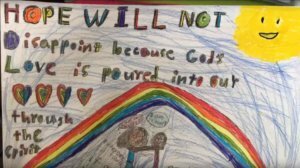 The PreK through eighth-grade students also submitted artwork centered on the theme of hope, and students ages 8-14 performed the song “Hope Will Not Disappoint.” Using the music and artwork, a slideshow centering on the theme of hope was created and shared virtually. To view the slideshow, visit https://youtu.be/h9t7Cx9-6kg. Confirmation candidates from St. Francis de Sales in Abingdon who sponsored a 5K run and 1 mile walk. On Nov. 4, 165 runners and walkers participated in the Shelter: Operation Sprint (S.O.S.) event that raised almost $4,000 for the Welcome One Faith Communities and Civic Agencies United (FCCAU) Homeless Shelter, Harford County’s only full-service emergency homeless shelter. 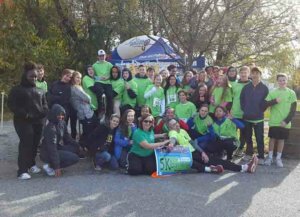 When given the challenge to design a service project inspired by the Beatitudes, the sophomore-aged candidates chose a 5K event. The 55 candidates worked in teams to execute all areas of event planning, from advertising and research to set-up and clean-up. Steps that Monsignor Slade Catholic School in Glen Burnie has taken to further involve its students in science, technology, engineering and math (STEM). The school, which welcomes students in Pre-K2 through eighth grade, recently opened a STEM lab, complete with a makerspace. Students participate in STEM-focused learning using snap circuitry, an OWI robotic arm, LEGO robotics kits, Ozobots, coding and 3-D printers. 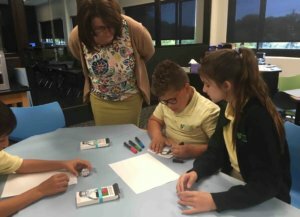 To help create a STEM environment at Monsignor Slade, the school welcomed a new staff member, Kathleen Oleszczuk, a technology and STEM specialist with more than 24 years of experience in teaching STEM. Archbishop William E. Lori celebrated the Mass that welcomed eighth-graders Hannah Cavey, Mia Ferraro and Bella Rabaiotti; and seventh-graders Jameson Doll and Beckett Tayler. They join current eighth-graders Shae Archie, Keola Evans, Jacob Hartness, Brody Holz and Raphaela Smaldone; and current seventh-graders Layla Metts, Mackenzie Orndorff, Pearl Walker and Violet Walker (see photo above). The principles of community, service, Marian spirituality and formation to service are at the core of every VMY meeting and activity. Seton Council members participate in food drives, volunteer at the Catoctin Pregnancy Center and the Seton Thrift Store, and visit with residents at St. Catherine’s Nursing Center. The age of Robbie Long III when his parents had him evaluated for developmental delays and discovered that he was on the autism spectrum. The diagnosis did not stop Robbie from achieving success, especially in wrestling. has played multiple sports at Our Lady of Mount Carmel School in Essex, including wrestling. 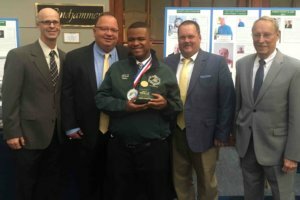 The Maryland chapter of the National Wrestling Hall of Fame awarded Robbie with its Medal of Courage for 2017. 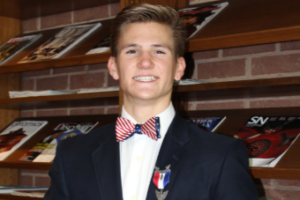 According the organization’s website, wrestling made Robbie’s high school experience special, and his presence on the team reminded teammates and coaches of the value of participating in a team sport.